Captain Beverly Pakii has become the first female pilot in Air Niugini and Papua New Guinea to captain a jet aircraft after attaining her command on Fokker Jet aircraft recently. With this achievement, it now enables Captain Pakii to be in command or captain flights on the Air Niugini domestic and international network that are operated by Fokker 70 and Fokker 100 aircraft. Her first commercial flight was on 04th January this year on a Fokker 100 aircraft, PX106/107 flight from Port Moresby to Lae and back. With her in the flight deck was First Officer, Taylor Yama. Air Niugini Chief Executive Officer, Simon Foo in congratulating Captain Pakii said ANG invests a lot of money and resources into training pilots and engineers every year and result as such are encouraging and promising for other female pilots in the system and also those who are aspiring to become pilots. He further stated that Air Niugini is very supportive of gender equality in the workforce and this attainment along with the achievements of other female pilots in a profession that is largely male dominated, demonstrates the airline’s belief, continuous support and investment in its female workforce. 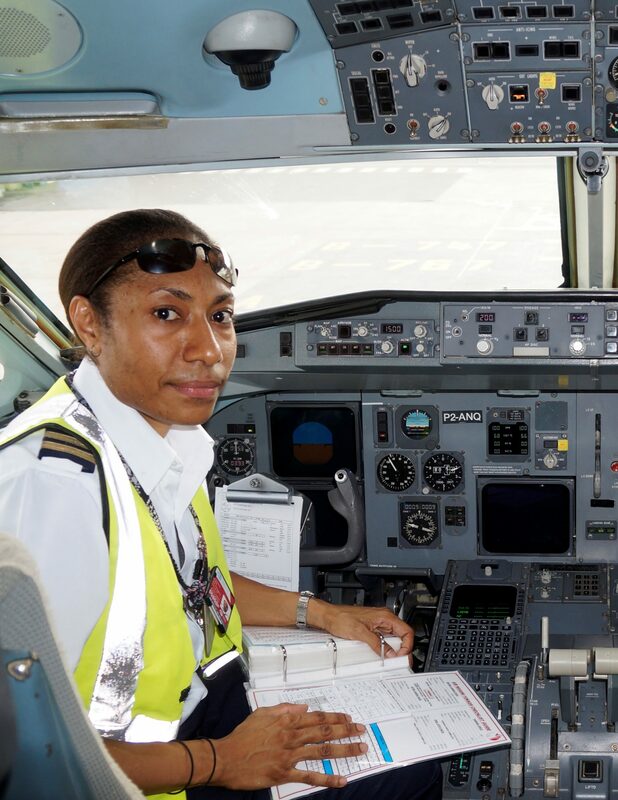 From a mixed parentage of Enga and Morobe, Captain Pakii’s previous achievements include being the first female pilot to be sponsored under Air Niugini’s Pilot cadet program in 2004. She was also the first female pilot under this program to have achieved her command on the Dash 8 aircraft and operated as captain on 02nd March 2015. On the 29th of May, 2015 she again created history when she captained the first ever female crew on Air Niugini’s subsidiary company, Link PNG’s flight PX 900/901 from Port Moresby to Tabubil and back. Captain Pakii humbly acknowledged the investment that Air Niugini has made in her career and sounded an encouraging message to her fellow female pilots and aspiring female pilots. “Believe in yourselves and remain focused on your goals as the outcomes are rewarding.” Pakii said. Beverly’s career as a pilot is not surprising, her father Captain Ted Pakii was an ex Air Niugini pilot who joined the airline from the PNG Defence Force in 1994. He operated on several aircraft types during his time, starting with Dash 7 and left after achieving his command on the Boeing 767.